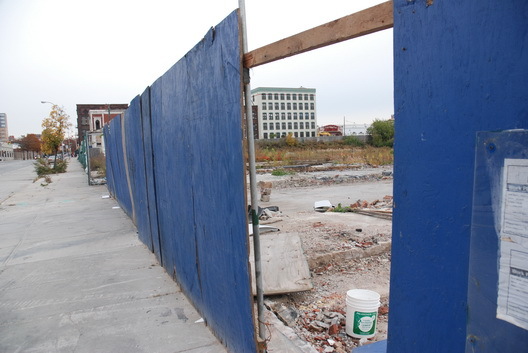 Given that the environmentally-challenged Gowanus Whole Foods site is semi-abandoned and that the grocery chain has a history of not keeping an eye on the property (well, except for recently when it made the Daily News and Public Advocate Betsy Gotbaum criticized them for failing to keep people off a hazardous property), there should be many opportunities for sightseeing over the coming holiday weekend. While the window is still open on a 2009 completion date for a while, one wonders when work will get underway. Given the challenges presented by the site both in terms of toxic remediation and construction, at some point even a 2009 opening will become impossible. We would assume that June or July is the point of no return for '09. Until that time, the site should be periodically open to the public due to the one-two punch of vandalism and lack of semi-abandonment.